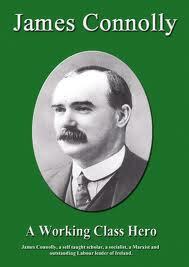 James Connolly – A Working Class Hero original DVD cover. This documentary, James Connolly – A Working Class Hero, is a comprehensive look at the life and work of James Connolly. From his birth in Edinburgh’s Little Ireland to his execution by the British state and via his life in the United States this great documentary explores Connolly and his times. Featuring contributions from the likes of Owen Dudley Edwards, James D Young and Garret FitzGerald with musical contributions from Christy Moore, Adrian Dunbar and Andy Irvine. Actor Colm Meaney reads Connolly’s works and letters and there is even a contribution from 107 Cowgate‘s Jim Slaven.